For what seemed likes months, the slogan "The Spectre Is Coming!" --complete with snazzy logo--crept into the nooks and crannies of the entire DC Comics line during the fall of 1965, and I for one couldn't have been more delighted!! Seeing that promise written across the bottom of at least one page of virtually every DC book really ratcheted up the excitement level!! What's the big fuss about, you ask? 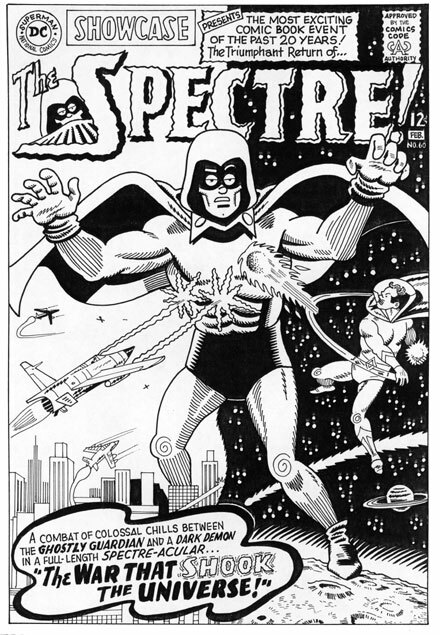 Well, it was the Spectre, you understand, THE SPECTRE! I'd first gazed on his ghostly visage four years earlier on a text page included in the Atom's debut appearance in SHOWCASE#34 (coincidentally my first issue as well). In an attempt to explain the Tiny Titan's antecedents, editor Julius Schwartz reproduced a picture of the Justice Society of America and explained to newcomers (me!!) that several of that era's superstars had forefathers in what was being described as some sort of Golden Age of Comics, the Atom being the latest to take on the name of a character from the past. This notion that there had been an entire line of costumed crime-fighters that predated my interest in the field by a good fifteen to twenty years fascinated me no end! Remember, at this time old comics were neither easily accessible nor were they being reprinted in any form whatsoever. We were still a few months away from the landmark " Flash of Two Worlds" which reintroduced the original Flash to a modern audience and set the stage for the soon to be annual Justice League/Justice Society summer summits. All I had to dwell on then were several crude illustrations and scant little information gleaned from the text portion of that single page. From those paltry scraps I conjured up this glorious image of a long lost, almost mythical group of characters. Without ever reading one, I almost instantly became a lifelong fan of Golden Age comics!! 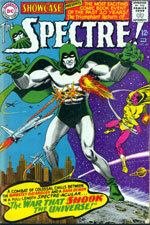 And so, finally, here was the Spectre. I say "finally" because in the intervening time, every other member of the JSA seated around that table with the Ghostly Guardian--and even some that weren't-- (it was a partial repro of the cover of ALL STAR COMICS#3 for those of you keeping score) had systematically and methodically been reintroduced to the swingin' sixties audience one by one. All except the Spectre. But when DC finally did it, they did it up right. Heralding it as "The Most Exciting Comic Book Event of the Past 20 Years", it didn't need the hard sell to send me off into an unsightly froth, but, golly, the big lead-up only intensified my anticipation!! Oboy! I couldn't wait until November 24th, the scheduled on sale date, and when it finally arrived and I'd secured a copy of SHOWCASE #60, guess what? I LOVED IT!! Beyond the truly classic cover, artist Murphy Anderson's art inspired awe with its combination of far-ranging scope combined with exquisite attention to detail. And Gardner Fox's script? Everything I needed in a cosmic comic book epic when I was twelve years old, I assure you. (Okay, okay, that's coded double speak for it really doesn't hold up anymore, but it sure seemed swell at the time...) After a few more tryout issues, our hero graduated to his own title, but it was as much a ghost as he was before long. Subsequently, he's been revived a score of times over the decades, usually without much lasting success. Maybe DC knew what they were doing when they stalled as long as they did before reintroducing the Disembodied Detective. Didn't matter. I'll always love my pale ol' pal if only for this single issue and all the excitement it drummed up. "The Spectre Is Coming! The Spectre Is Coming!" And I for one, folks, was glad he did! !